Westminster Council has approved plans for a new theatre on Charing Cross Road, reckoned to be the first purpose-built West End theatre in 30 years. The scheme, as visualised above, also includes a pedestrian walkway between the main road and Soho Square. The new facility will cater for audiences of up to 500 people, and will specialise in new and cutting-edge productions. 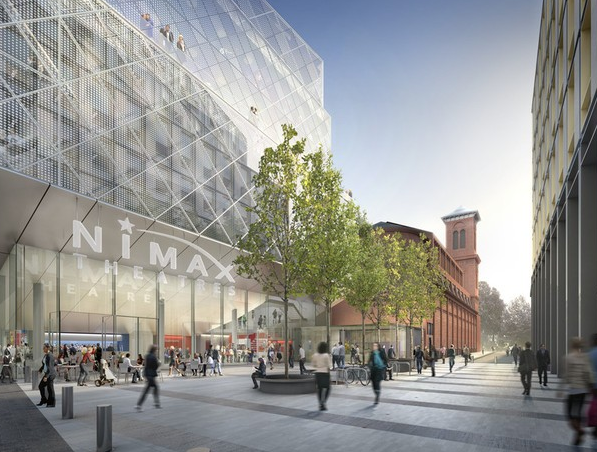 Nimax, which currently runs the Apollo and Lyric theatres, will take charge. But...we'll have to wait. Construction can't begin until the completion of the new-look Tottenham Court Road station and its Crossrail facilities, earmarked for 2017. That means the first shows won't run until 2020. The development is near the site of the old Astoria. The much-loved music venue became one of the highest profile casualties of the Crossrail construction programme when it was razed in 2009 to make way for the dig. The council also approved mixed-use (and some might say mixed-quality) plans for three other over-site developments at this and the nearby Dean Street dig. The new buildings will be developed by Derwent London. Ian Visits has more detailed diagrams and photos from a recent site visit.